In Canada, we have signs warning drivers of large, antlered animals that might at any moment leap into the road- even in the city. In Paris, there are stilletoes (and the only antlered creatures likely to cross paths with you are wearing McQueen). Posted by la femme at 5:52 p.m.
wait, where is the first picture taken? is that a real street sign?? I love that sign and I love that photograph! Thank you for sharing both! thanks for the heads up! 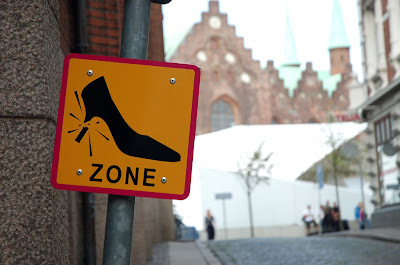 if only they had those signs warning signs for crocs and white tennies.